15th August, our Independence Day is just round the corner! 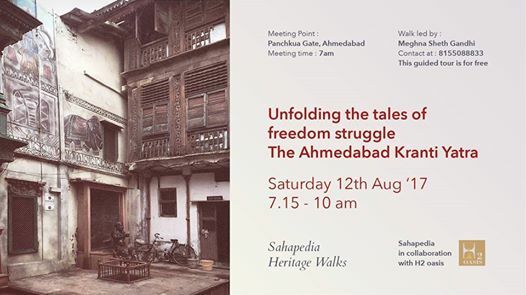 So here is an opportunity to join in for this unique walk in the Khadia area of the walled city of Ahmedabad. Get to know of the role played by the very people of Ahmedabad during the British rule and the circumstances and developments that fuelled the Indian freedom struggle from this land. The walk also celebrates the entrepreneurial spirit of the people of this illustrious city which laid the foundation for Gandhiji’s freedom activities. Come and get intrigued by stories that never found a place in your history textbooks! *Mandatory registration closes after 25 entries. (Step 1- Please like and share the page to register. Step 2- Fill the form to confirm your registration. In case one is unable to participate, after having registered online, do inform about the same through a text message or an e-mail, ideally at least a day prior to the walk. * Parking available near Khadia Cross Roads. * Wear raincoat or carry umbrella. * Wear comfortable footwear and carry water.